We all know that when someone tells us to “stop and smell the roses” they’re telling us to slow down and enjoy the little things in life. And, they are absolutely right. In our hearts we know this to be true, but do we listen to our hearts? I can’t say that I always do. Don’t get me wrong, I like my “normal job”, but five days a week, like millions of other people, I’ll rise from the near-death of sleep, get in a dead machine, drive over lifeless paved roads, and enter an office where even the potted plants are probably dying a slow death. I am lucky. I have a view of some trees outside my office. (They’re planted in narrow beds of soil, edged with curbing, and surrounded by hot and shimmering striped blacktop. I always picture them angry about their surroundings). As millions of other people may do while at work, I’ll get lost in a daydream about an exotic tropical place where the sun, wind, and water come together to mix color and light like some ex-pat French Impressionist, just for my enjoyment. I’ll look out my office window and envision the changing tides, waterspouts forming far out on the horizon, or the evening light as the sinking sun drapes its last golden tones across the happily swaying coconut palms. And then the phone in my office will ring. My family and I just spent some time paddling SUPs (stand-up paddleboards) through the mangrove islands that make up the Florida Keys. As in previous trips, we had planned to rent a boat and visit an offshore coral reef, but a stiff breeze and a choppy sea would keep our adventures closer to shore. Any disappointment we felt from not boating faded away as soon as we took our first paddle strokes out into the grass flats of Florida Bay. SUPs offer a unique vantage point that snorkeling cannot. While you are standing up, you can see down into the clear water below you from an angle you don’t normally experience, not even atop a kayak. You glide along as quietly as a cloud, your passing shadow only a temporary mark on the seascape below. The shallow water in the tidal creeks and grass flats has a clarity and color palette all its own. 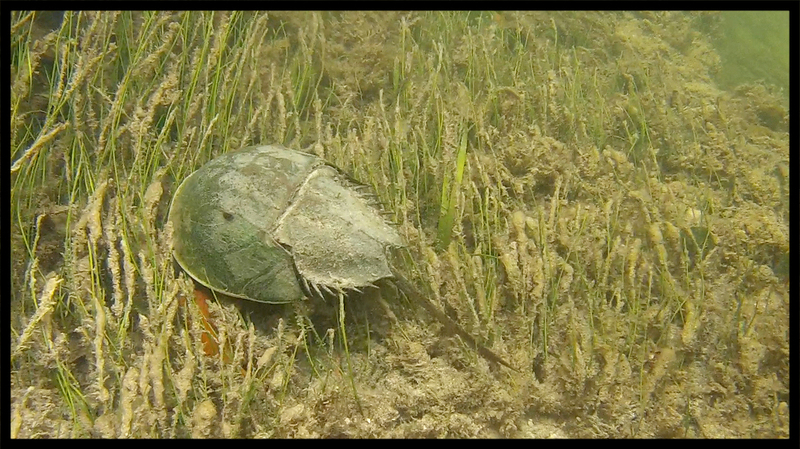 The sea grasses sway gently in the current, the fingerlike mangrove roots splay out beneath the surface, and a myriad of little creatures dart in and out of all of it. What I saw, while gliding silently only inches above the sea-grass beds, is that every square inch beneath me was pulsing with life, and that this living blanket extended beyond my tiny floating platform for hundreds of square miles in every direction. Until now, I had never really given all this marine life the attention it deserved. All of this, and my snorkeling gear never even left the car. The mangrove islands that make up the Florida Keys number approximately 1700, and these are just the major ones. Within the Keys archipelago there are countless winding channels, grass flats, and tidal creeks to explore. We paddled our way through just a few, and no, they weren’t the colorful coral reef ecosystems that most yearn to see, but they held our attention just as tightly. Of course, for every creature that we saw, there were likely hundreds more we didn’t see. The grass flats and mangrove root systems provide a safe haven to scavengers and predators alike, and the warm shallow backwaters are the perfect home to what must be one of the most prolific species in the keys: the Cassiopeia jellyfish. In certain areas, Cassiopeia, or the upside-down jellyfish, can seemingly inhabit almost every square inch of the bay floor. They are unique in that they spend their lives largely upside down, photosynthesizing colonies of single-celled plankton on their bodies, from which they feed. In effect, they are like little farmers, each with a personal garden plot right on its underside. Cassiopeia was named after the vain Greek goddess, whom Poseidon punished by tying her to a chair in the heavens upside-down. These jellyfish are beautiful and flowerlike, but we always give them lots of room, as they can inflict quite a sting. (There’s even a species of crab that carries a Cassiopeia around on its back as a defense mechanism, like a living can of mace). So, before I am accused of writing the most uninteresting article ever about some slimy jellyfish, consider this: All of the creatures in the mangrove island ecosystem are there for a reason. Some may be more prolific than others, but all exist with purpose. The conditions in which they exist are relatively harsher than in the open ocean. As the tide recedes in the mangrove islands, the shallow water warms up considerably. Evaporation accelerates, and in turn the salinity of the water increases. At times the salinity in the mangrove swamp can be twice that of the open ocean. Biodiversity in these areas is reduced, as fewer species can tolerate the harsh conditions. Cassiopeia is one of them, and if the conditions aren’t right, they flap their squishy bodies and commute. Yet the upside down jellyfish doesn’t daydream about being anywhere else. It doesn’t do its little farming job wishing to be an apex predator. I’m anthropomorphizing more than just a little bit here, but my point is that once Cassiopeia settles in, they pretty much stay put. As my SUP glided over them in the shallows, I thought about how they would be quietly pulsing away, long after I pass by, day after day, regardless of whether I was even there or not. At some point, I myself am forced to leave that quiet world, tie my SUP back onto the car, and go home. In the natural world, you tend to find each species exactly in the places for which they are best suited. This is rare in humans, I think. In one of the large shallow bays we like to paddle, there is a houseboat that is more or less permanently anchored. A woman lives on it alone with her dog. Her “car” is a small skiff, and floating buoys mark her “yard”. To me, she is as settled as the Cassiopeia. 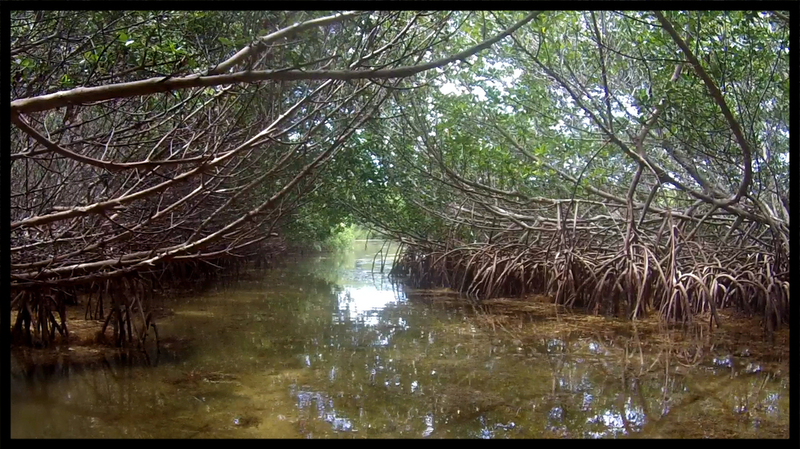 Back in my office I’m already daydreaming about the peace and tranquility I experienced paddling through the mangroves. When I was there, I found myself saying out load more than once, “I could do this all day.” I know I will again. Being right where you need to be is something for which we all strive. Sometimes, in spite of wind and tide, we know just where to go, and we get it right.